AEFJN Annual General Meeting | M.Afr. 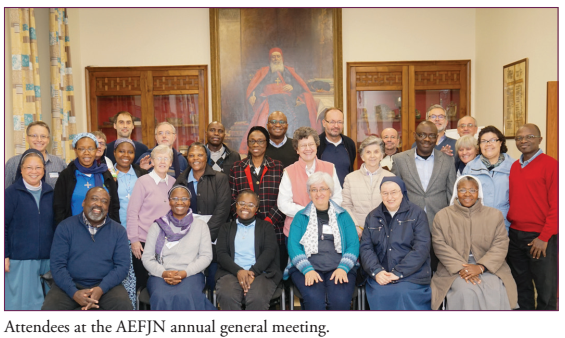 Africa Europe Faith and Justice Network (AEFJN), a network of 48 congregations of men and women religious working for economic justice between Africa and Europe, held its Annual General Meeting (AGM) on the 10th of November 2017. Around 20 members congregations were represented at the meeting which was held at the Generalate of the Missionaries of Africa. Reports were given by the Secretariat in Brussels and the Executive Committee on the status of work being done by the AEFJN and how to enhance its work. François de Paul Houngue, SMA, president of AEFJN, reported on the work done by the Executive Committee. One of the mandates from the last AGM was the promotion and creation of Antennas (satellite offices) in Africa. Now in the Central African Republic and the DRC, the Antennas maintain regular contact with the Secretariat. He thanked the outgoing Executive Committee members, Rebecca Sepepka, SUSC and Denise Bangn’a, OLA for their long, passionate commitment. Chika Onyejiuwa, CSSp, José Luis Gutierrez Aranda and Gino Brunswijck from the Secretariat reported some success stories of the network’s advocacy in collaboration with other civil society organizations in line with the priorities of the Network, namely Food Sovereignty, Land Grabbing, Trade, Natural Resources and Raw Materials. Loredana Dalla Libera, CMS talked about the Italian Antenna. She joined Sr. Francesca Sekli, PSA, who has been working for the Antenna for many years. They are inviting the member-congregations to join the Antenna. Next PostNext Gaby Claerhout, R.I.P.